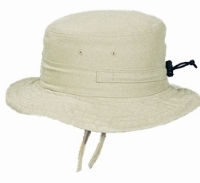 It won’t be easy to let this Cotton Twill Bucket Hat go with its toggle-on crown to adjust size, and adjustable chin strap. One size fits most. Available in Khaki.